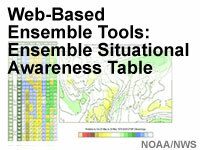 The National Weather Service (NWS) Western Region (WR) has developed a Ensemble Situational Awareness Table (ESAT), which uses probabilistic NWP to bring attention to the potential for extreme events, especially in middle-range forecasts. The lesson, which is the first of two on the ESAT, describes the ESAT and how its data can be used to support assessment of extreme weather event forecasts. Additionally, statistical methods, including employment of reanalysis and NWP model climatologies (R-Climate and M-Climate, respectively) are described in reference to the products available in the ESAT. I thought the lesson provided valuable information on Ensemble tools and would recommend it to anyone whom regularly prepares operational weather forecasts. The lesson is good but simplified. This lesson was easy to understand and well-structured. It gave a great overview of the Ensemble Situational Awareness Table with real world examples. I particularly liked the information about verification of ensemble systems.This is the first time I have looked at verification diagrams and actually understood what they meant. The explanations were great and the practical exercises with questions about what the diagram was actually telling me helped to reinforce that knowledge. A great educational approach! I have already shared this with the team who is building ensemble forecasting system products and the verification community of practice here at the Bureau of Meteorology in Australia and would highly recommend this lesson to anyone interested using ensemble NWP or the verification of ensemble models. Describe how ensemble tools are used to support the assessment of extreme weather event forecasts.